Lucy’s thoughts: I actually read this book a while back, but up until now I realized I never posted a review on it, so here I am. I have to admit I love anything written by John Green, he is by far an amazing author that mostly writes Young Adult novels that can easily relate to anyone in any age range. He’s the type of author that can easily draw you into the story, and you can’t help but fall in love with the characters and within the story there will ALWAYS be quotes that you’re going to have to write down because they’re so true to your life. 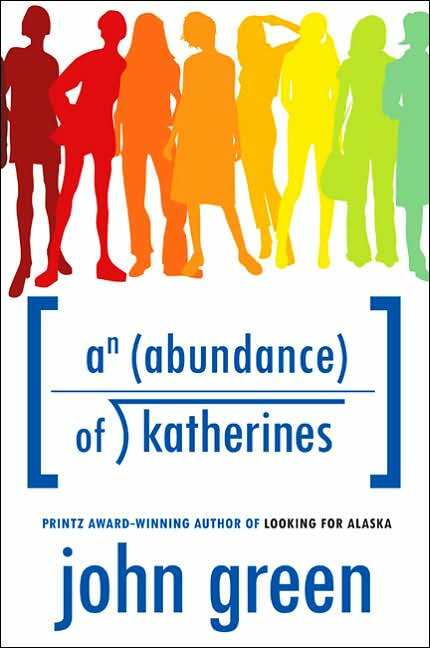 After reading “Looking For Alaska” and “Will Grayson, Will Grayson“, I decided to give “An Abundance of Katherines” a try. 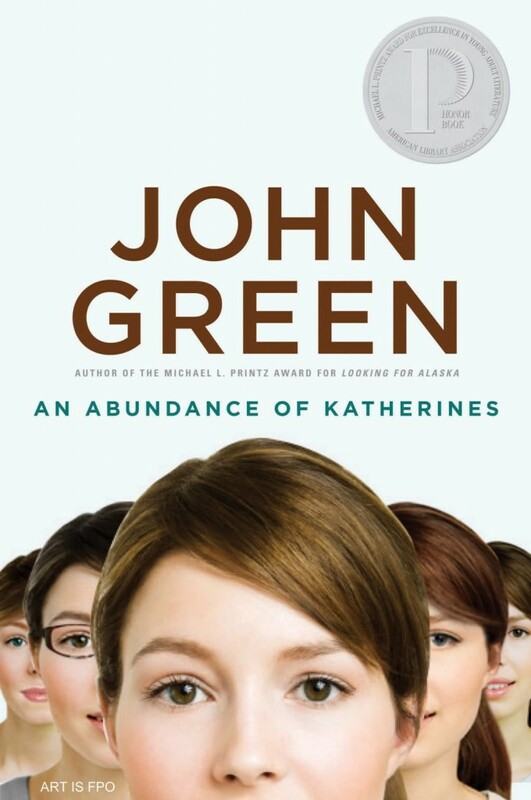 “An Abundance of Katherines” is the story about Colin Singleton, a seventeen year old kid who has always been considered a prodigy, yet he doesn’t feel like a genius, through life he’s been looking for his Eureka moment. Over the course of his life, the only girls he has ever dated are named Katherine, and upon finishing high school, Katherine #19 dumped him, depressed by this his best (and only) friend Hassan Harbish, convinces Colin to go on a roadtrip to forget about the break-up. On their roadtrip, they end up in the town of Gutshot, Tennessee, after following signs that apparently the tomb of Archduke Franz Ferdinand was there, they encounter Lindsey Lee Wells, who is the tour guide and a “paramedic in training”. After a short time in Gutshot, the boys decide to stay and work for a while at the town’s factory of tampon strings, and are soon employed by Lindsey’s mother, Hollis. During their time there, the live with Hollis and Lindsey in their home. During Colin’s time off from work, he would be creating a theorem that is bound to determine the length of any relationship based on several factors from both parties and would be able to tell the future for any two people. Colin tries this theorem with all of the Katherine’s he ever dated (graphs included in the book), and for his time being in Gutshot, he develops a crush on Lindsey but knows nothing could happen between them because not only she has a boyfriend, but also her first name isn’t Katherine. Colin is a character that would always be anagraming words, knows too many languages, yet doesn’t consider himself a genius yet, he’s still trying to find his moment of greatness when he’ll discover something, and this happens when he goes on the roadtrip with Hassan. Hassan is a character that loves Judge Judy, and is somewhat a procrastinator, always delaying his college education just because he is lazy and would rather watch TV all day than going to school. Throughout the book, there’s footnotes at the bottom of each page, sometimes its because Colin and Hassan have spoken a different language and the translation is at the bottom, or just some cool facts that the author John Green wrote that will have you laughing from beginning to end. As well as the footnotes, there’s also graphs of the Katherine theorems and you get to know each Katherine’s backstory, John Green also adds at the end of the book an explanation for each theorem and how (if you really want to apply them to your life) they could work. Overall, this book is just fantastic: its full of sarcasm, witty and intellect, that only John Green knows how to do and make it enjoyable, characters that you can relate to and math theorems that even if you don’t like numbers, you’ll end up loving them. I can’t wait to read John Green’s next book “The Fault in Our Stars” this upcoming January, so be on the lookout for that one! Gaby’s thoughts: I had heard a lot about John Green. People worshiped the guy, and I had no idea why. I had heard of Looking for Alaska and Will Grayson, Will Grayson, but never ventured to read them. It wasn’t until I stopped at a local Borders a few months ago that I found An Abundance of Katherines. It looked interesting and made a snap decision to purchase the book. And I’m really glad that An Abundance of Katherines was my first John Green book. Lucy explained the story above; so it would be boring to reiterate. There are several things I love about this book. The characters are well-developed and relatable. Yes, Colin may be genius, but his insecurities are something everyone faces to some extent. We all try to find some explanation or reason to why someone broke up with us or why someone doesn’t like us. We all feel like we need a solution in order to move on with our lives. Maybe we all don’t dish-up mathematical theorems to solve life’s relationships problems, but we do find our own method of coping and understanding. The rest of the characters also contain a considerable amount a depth, each serving a purpose in Colin’s story. That’s what I love about John Green’s stories. There isn’t any over-embellishment, or non-essential information added to make the story grander. Each word, sentence, person has a rightful place in the story. Even the footnotes belong because they work so well with the kind of person Colin is. Altogether, the plot is entertaining and interesting. Green never dumbs down his stories, which I feel some young adult writers do. He tackles emotional complexity so easily, with the right amount of drama and comedy, and that makes him one of the best writers around…ever. If you haven’t read a John Green book yet, I honestly recommend you start with An Abundance of Katherines. Then go for Looking for Alaska and Will Grayson, Will Grayson. I haven’t read Paper Towns yet, but that is definitely on my list, along with his upcoming novel, The Fault in Our Stars. Support our site and purchase An Abundance of Katherines at our TYF Store! You can also pre-order The Fault in Our Stars from our store as well.